All aboard for tropical adventures! 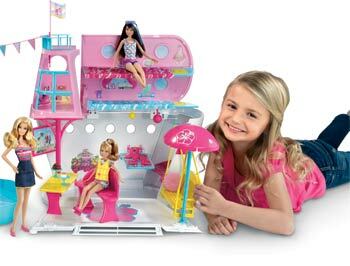 Girls can treat Barbie doll and her sisters to the ultimate family vacation with this colorful boat, featuring multiple decks, a pool, slides, lounge chairs, and more! Features fun areas for eating, sleeping, playing, swimming, and relaxing. (Dolls not included.) View larger. It's bon voyage for Barbie doll and her three sisters! With this magical cruise ship, your daughter can play out the perfect family vacation -- on the "water" or docked at shore. The side panel of the large-scale boat opens to reveal an additional deck below and expands the play space to 3.5 feet. With areas for dining, playing, lounging, and sleeping, this delightful cruise ship lets girls sail away into imagination and play! Two slides race to the pool! 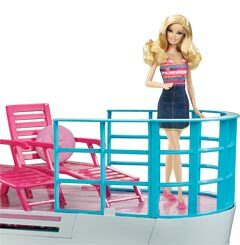 The brightly colored ship features a top deck with captain's wheel and space for two lounge chairs (pink, of course!). Pilot the ship into shore or thrown down pillows and relax. When the boat docks, fold down the side panel -- an umbrella pops up, a grand buffet rotates around, and a swing flips out. 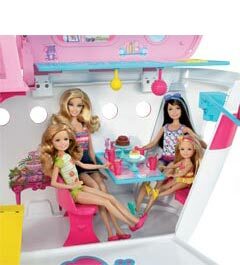 The sisters can sit at the table for a shared meal or relax and watch television on the flat-screen "TV." The top deck also opens to reveal a luxury ocean-view suite with two beds for slumbering soundly. When it's time to make a big splash, the large pool slides out from the base of the boat and features two thrilling slides. To activate the dolphin fountain between the slides, just fill the reservoir in front of the boat, and water shoots directly into the pool. The dolls (not included) can take turns going down the slides and then soak up some rays while lying poolside in the lounge chairs.